Secondary Alkane Sulfonate (SAS) Market size was more than USD 900 million in 2016 and is likely to observe gains close to 5% CAGR over the forecast timespan. Increasing household detergents sales will be the chief factor propelling the overall secondary alkane sulfonate (SAS) market share over the forecast timeframe. 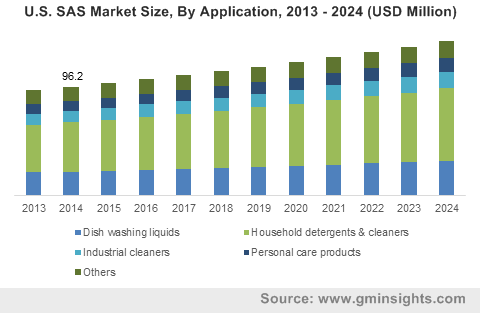 In 2016, the overall household detergents industry size was more than 30 million tons and is set to surpass 50 million tons by 2024, with estimated gains of over 6% CAGR from 2017 to 2024. Superior water solubility, excellent wetting action, noticeable foaming power, exceptional grease- and soil dispersing characteristics of the product makes it a chief surfactant ingredient used in detergents. In addition, the product offers value added washing, emulsifying and cleaning performance accompanied with strong surfactant features and high chemical stability across wide range of pH values. This makes it viable across household as well as industrial detergents. Thus, elevating detergents demand over the forecast timeframe will positively impact on the global secondary alkane sulfonate market size. Improving lifestyle dynamics along with high spending capacity of consumers have substantially propelled the personal care product demand in the recent years. The product owing to its superior foaming, emulsifying and moisturizing characteristics is widely used in personal care products including shampoos, shaving cream, bar soaps, etc. The overall cosmetic industry business was roughly more than USD 150 billion in 2005 and surpassed USD 220 billion in 2016. Increasing consumer awareness towards personal wellbeing has stimulated personal care or cosmetic product sales across the globe, which in turn has driven the overall secondary alkane sulfonate market share in the recent years. Besides various advantages and features offered by the product. The global secondary alkane sulfonate market size is sternly directed and regulated by the government regulations on account of potential threat of product exposure for human health and environment. For instance, direct skin contact of the product with high concentration may cause irritation and oral intake of the product via residue deposits from plates & crookery may cause indigestion. Thus, the product is used limited quantity in detergents. Moreover, product disposal in the water bodies is harmful for aquatic flora and fauna, due to its toxicity. These aforementioned may obstruct the global secondary alkane sulfonate market share over the forecast timespan. 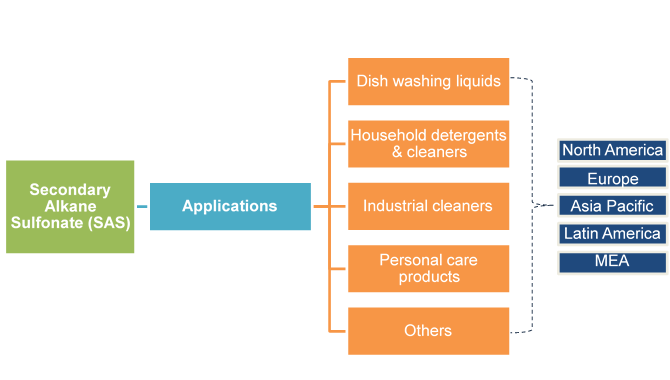 Secondary alkane sulfonate market share for household detergents & cleaners led the overall business and accounted for over 40% of the global industry share in 2016. Detergents and cleaners are basic requirement for carrying out day to day domestic applications such as washing and cleaning. The product is an anionic surfactant and is a major ingredient in detergents and cleaners. Thus, increasing household detergents & cleaners demand on account of improving consumer awareness towards health & hygiene will boost industry growth by 2024. However, the segment is forecast to witness moderate gains from 2017 to 2024 due to prevalence of stringent regulations in order to ensure human safety, which limits the product demand. The global secondary alkane sulfonate market size for industrial cleaners is projected to exhibit gains close to 4% CAGR from 2017 to 2024. Cleaners are extensively used in industries to remove stains caused to grease, oil, etc. Thus, rapid industrialization across the globe will positively influence on industrial cleaners demand, which will subsequently boost the global secondary alkane sulfonate market size in the coming years. Asia Pacific led the secondary alkane sulfonate market share in 2016 and recorded more than 40% of the global business share. Enhancing consumer spending pattern, lifestyle dynamics along with rapidly growing population in China and India was boosted the household detergents and personal care product sales in the region. In addition, robust industrialization in the region on account of government support to upscale its manufacturing business will complement the secondary alkane sulfonate market size for industrial cleaners by 2024. North America secondary alkane sulfonate market size is likely to experience growth more than 3.5% over the forecast timeframe. The regional growth will be mainly attributed to robust demand for applications including dish washing liquid & cleaners, industrial cleaners and personal care products. However, prevalence of stringent government regulations laid by the EPA and FDA, regarding SAS usage in personal care products and household detergents may hamper regional secondary alkane sulfonate market share by 2024. The global secondary alkane sulfonate market share is moderately competitive due to presence of various large and medium scale manufacturers. Some of the industry share contributor includes Clariant Corporation, Lanxess AG, The WeylChem Group, BIG SUN Chemical Corporation, Acar Chemicals and Rajvin Chemicals. These companies are involved in expanding their production capacities in order to meet the increasing product demand across the globe for various applications. Furthermore, key players including Clariant and Lanxess have presence across multiple stages of the industry ecosystem which helps them in attaining competitive advantage. Secondary alkane sulfonate (SAS) is an anionic surfactant, which is widely used across household detergents & cleaners, personal care products, industrial cleaners and dish washing liquids particularly due to its superior foaming, emulsifying, moisturizing and superior chemical stability across a wide pH range. In 2016, household detergents & cleaners accounted for a major chunk of industry share, as detergents & cleaners are essentially required to carry out domestic applications. Regionally, Asia Pacific was the highest business share contributor in the same year, the regional growth is mainly attributed to rapid industrialization along with increasing personal care product demand in the recent years.